Dear Parents and Families, On behalf of the entire staff at Thomas Jefferson School, I would like to extend a warm welcome to the 2018-2019 school year!! We have a talented and dedicated group of teachers who are thrilled to meet and get to know your children. All of us here at Jefferson School are committed to making this school year simply amazing for your child! We thank you in advance for everything you do to support your child’s education, and know that together we can make Jefferson the best school in Orange County. This year’s focus will be on building strong foundations in literacy. Not only is proficient reading across content areas critical for accessing and understanding the Common Core State Standards and the Next Generation Science Standards, reading is crucial to success in life and future careers. Today’s readers are tomorrow’s leaders. We want to instill a joy for reading widely, not just for information but for enjoyment. While reading nonfiction builds knowledge and understanding, reading fiction promotes creativity, imagination, and empathy. Please join us as we encourage our school community to READ, READ, READ! 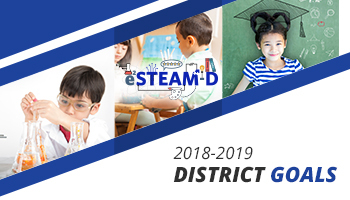 Jefferson School is a STEAM school, a school that puts a focus on inquiry, data, and problem-solving through the disciplines of Science, Technology, Engineering, the Arts, and Math. All K-5 classrooms will engage in STEM projects from the Project Lead the Way (PLTW) curriculum, where they collaborate together in teams and ask questions and problem-solve a real-world scenario…much like many of our careers today ask for. Here at Jefferson we are preparing young scholars for college and 21st century careers. 21st century education is a globally minded because technology is bringing the world even closer together! We are proud to offer the first and only Korean/English Dual Language Immersion Academy in Orange County starting with Kindergarten 2019-2020. Dual Language Immersion programs offer a unique opportunity for students to build bilingualism and biliteracy in a second language. The Korean language is considered a critical language by the National Security Agency, and is in high demand across businesses and economies both in the U.S. and abroad. I encourage you to attend an info meeting or meet with me if you are considering this! 6th grade classes will receive instruction in computer science through a program called Codologie. This year we are planning to start up some wonderful enrichment opportunities, like Robotics Club, TED-Ed, Choir, Band, Art, and other extracurricular activities. Keep an eye out for more information! Communication is important and we want to keep you informed of what happens daily at Jefferson School. In addition to monthly newsletters, we encourage you to follow us on Twitter @JeffSchoolNews and/or download the free Anaheim Elementary SD app on your smartphone (both IOS and Android accessible) to get the latest updates/events from Jefferson pushed to your phone instantly. Staying connected helps families see what goes on at school throughout the day. Please feel free to contact me with any questions or concerns you have at anytime. I’m eager to meet you and look forward to serving you as principal this year. Warmest regards, Dr. Sandra Song Principal, Jefferson School ssong@anaheimelementary.org Go Eagles!